Throughout LFC's 125th anniversary year, Liverpoolfc.com will retrace the club's history through the striking images that plot a fascinating journey. Twentieth in the series is a photograph capturing the act of one of the greatest FA Cup final goals in history being scored. As the clock wound down and Liverpool’s hopes were fading, something astonishing happened. “I caught it really sweetly,” said Steven Gerrard, in a fine example of the art of the understatement. The date was May 13, 2006. The venue, Cardiff’s Millennium Stadium. Ninety minutes of a topsy-turvy FA Cup final had elapsed, and the Reds trailed West Ham United 3-2. Liverpool’s captain had made one goal and scored another, but it appeared that his efforts and those of his exhausted teammates were to be in vain. “The fourth official has indicated there will be a minimum of four minutes time,” came the tannoy announcement. 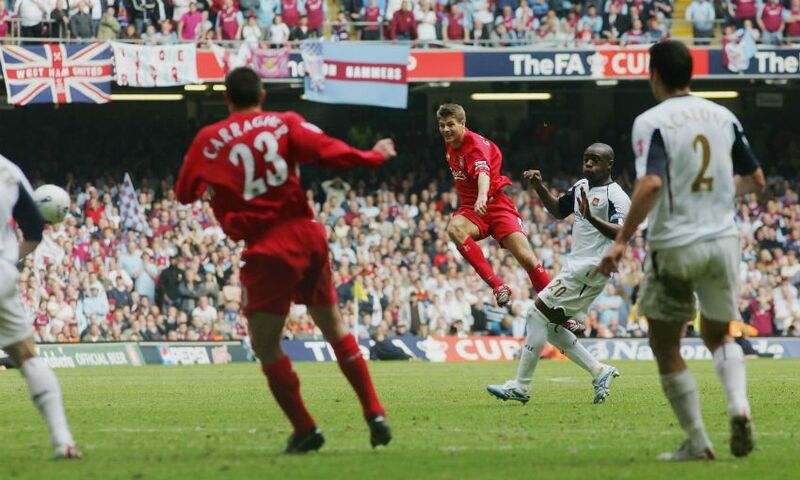 John Arne Riise’s hopeful cross from deep was repelled and the ball made its way to Gerrard. It was bouncing and bobbling and the skipper met it around 35 yards from goal. A half-volley of astounding technique, power and accuracy was sent rocketing beyond the helpless dive of Shaka Hislop and into the bottom corner and, from nowhere, it was 3-3. “It was a great moment when it went in, and I don't know how I did it. I just concentrated on giving everything to the shot,” Gerrard explained after he’d scored in the shootout to help Liverpool win 3-1 on penalties. The Liverpool captain’s super-human performance that afternoon has been immortalised. That match will not go down in history as merely ‘the 2006 FA Cup final’. Instead, it will forever be known as ‘The Gerrard Final’.